Maureen Wroblewitz Makes It To New York Fashion Week! See what she’s been up to in the Big Apple! Maureen conquered the busy NYC streets in a sleek bralette-and-midi skirt combo topped with a fiery leather jacket. Her makeup was kept light and fresh to put the focus on her outfit. Leather instantly spices up any outfit, making Maureen's LBD anything but basic. She complemented her edgy ensemble with monochromatic makeup and slicked-back hair. Maureen proves that a black jumpsuit is a must-have in every girl's wardrobe. With her long, fluttery lashes, the look is the perfect mix of classy and sultry. After her shoot, Maureen attended the much-awaited Maybelline New York Fashion Week party along with her fellow Maybelline Fashion Week 2017 correspondents Kryz Uy and Jigs Mayuga. Held on September 9 at the mansion on 2 East 63rd Street, the event was a grand celebration of style, with beauty and fashion mavens from all over the world gathering together for one night. Celebrity makeup artist Jigs Mayuga, Maybelline ‘It’ Girl and AsNTm Season 5 winner Maureen Wroblewitz, and fashion and beauty blogger Kryz Uy at the Maybelline Content Studio. One of the Spring/Summer 2018 makeup looks Jigs spotted backstage at Public School’s show. 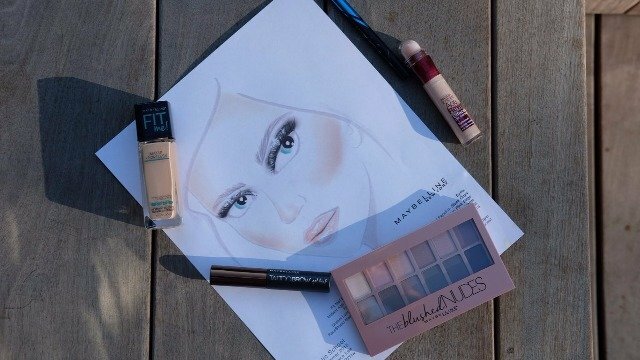 To learn more about #MaybellineFashionWeek2017, check out Maybelline’s YouTube channel and Facebook page. Follow #MaybellineFashionWeek2017 correspondents Maureen Wroblewitz, Jigs Mayuga, and Kryz Uy on Instagram for real-time updates straight from New York!